Ensure your workplaces are able to be seen by clients. Whether your office is new or more established, it's always essential to be certain that that your company is keeping with ADA regulation in relation to the signs around your office. This Braille No Smoking Sign just the thing you need to get for your office? Get yours here! This sign has rounded corners with an adhesive backing and measures 6 x 9". Recently the ADA has been working to find organizations that do not seem to adhere to their sign regulation policies. Make sure your start up is not at risk of being hit with a large fine for failure to conform with proper ADA laws. Here at Custom Signs, we check to be certain that that all of our ADA signs are completely up to date with all the latest ADA office sign regulations currently in place by the state administration. Each of our signs is constructed in our Florida factories and will be given free delivery at no additional cost on orders more than $75. 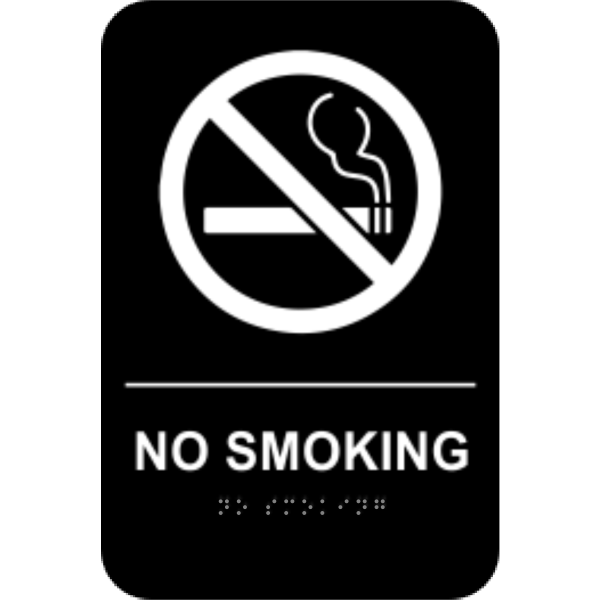 This particular No Smoking Sign w/ Braille will be a fantastic improvement to any workplace building. Get your own today! This sign has rounded corners with an adhesive backing and measures 6 x 9".